West Highland Brewing. I first saw the name at the Oregon Brewers Festival in July. I wondered if they had invited a Scottish brewery. I soon realized the place isn't in Scotland at all. Nope. The brewery is located up in the Couv...as in Vancouver. It's another example of the good things happening up there. What's up with the name? I'll get to that in a moment. West Highland is a small 1 bbl brewery operated by Don Stewart and Sam Simms. Like another up-and-coming Vancouver brewery, Heathen, West Highland is located in a residential garage. It's not fancy. The West Highland space is actually quite a bit smaller than the one Heathen calls home. But it gets the job done...for now. I've been vaguely acquainted with Don Stewart for a number of years. We worked as part of volunteer teams at several Oregon Brewers Festivals dating back to the mid-1990s. Later, we worked for the same Vancouver company for a short time. Don was there only briefly and we mostly lost touch after he left, more than 10 years ago. When I discovered West Highland and realized Don was involved, I wasn't surprised. I knew he was an avid home-brewer going back many years. He hooked up with the much younger Simms by chance. 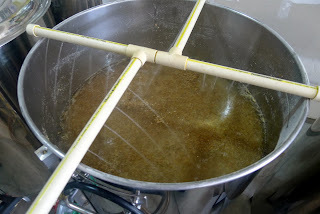 It turns out Sam was dating Don's daughter and observed Don's home brewing activities. Sam eventually asked if he could join in. That was in 2010. They got their business license and first customer a year later. I had heard that West Highland beers have drawn mixed reviews. I'm sure that's true and I'm pretty sure I know why: They simply refuse to get caught up in the ongoing hops arms race. None of their beers are particularly beefy in terms of IBUs. "Neither of us are fans of super hoppy beers," Stewart said. "Our goal has always been to produce quality, well-balanced beers for people who, like us, don't care for hoppy beers. That's our niche and we've been fairly successful with it so far." Of course, that kind of thinking tends to cause consternation with the hophead crowd...and it's a big crowd despite the growing popularity of fruit beers, sour beers, etc. There are still a lot of people out there who want hoppy and nothing else. They probably aren't going to appreciate West Highland beers. A good example of West Highland's approach is Mango Moon Ale, their entry at the 2013 OBF: It clocked in a 6.6% ABV and 18 IBU. Mango Moon was on my tasting list, but my notes are sketchy. My pigeon shorthand describes it as "mildly tart without much aroma and with minimal mango character." Nonetheless, this beer was named top fruit beer at the festival. So much for my scribbled thoughts.. They do not have a functional tasting room in their garage brewery. The taps they have there mostly to provide tastes to prospective draft customers. And vagrant beer scribes.That's about it. They had two beers on when I visited: Michel's Brown Porter and Fire Hydrant IPA. The Porter is named for a friend and Steinbart's employee who helped Don develop the recipe. This beer doesn't have the color of a typical Porter...it's much lighter. They call it a "gateway" dark beer, and I suppose that's a good description. This is their best selling beer, likely because it appeals to a wide range of customer pallets. It tastes pretty good without being overbearing in any direction. Fire Hydrant IPA is not your typical Northwest IPA. 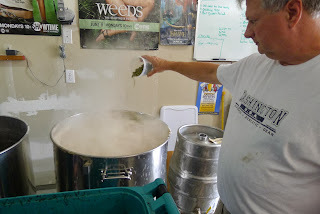 It leans on late addition hops and full leaf dry-hopping (Citra on both counts) for aroma and flavor. The beer clocks in at 65 IBU and 6.5-7.0% ABV. The IBU number seems generous. I realize these values can be kind of nebulous, but I didn't detect 65 IBUs. Oh well. It's a nice effort on the whole. West Highland has some other beers, including a Scottish Ale I was hoping to taste. They make it solely for the Vancouver Pizza Company. It's a bigger beer and takes more time to brew, and they didn't have it to taste. Mango Moon is obviously another standard, and I would have given it another try if they hadn't been out. Sam had a decent cider on tap, but he says that's for in-house consumption only. Thanks largely to the popular success of Mango Moon at the OBF, West Highland has been invited to the Holiday Ale Festival. Sam and Don were talking about the beer, which will likely be called Holiday Spiced Ale. Supplying kegs to festivals can be a challenge for these guys due to their limited capacity. But they made it work for the OBF and they say they can accommodate the HAF, as well. The overall approach here is confident, but cautious. 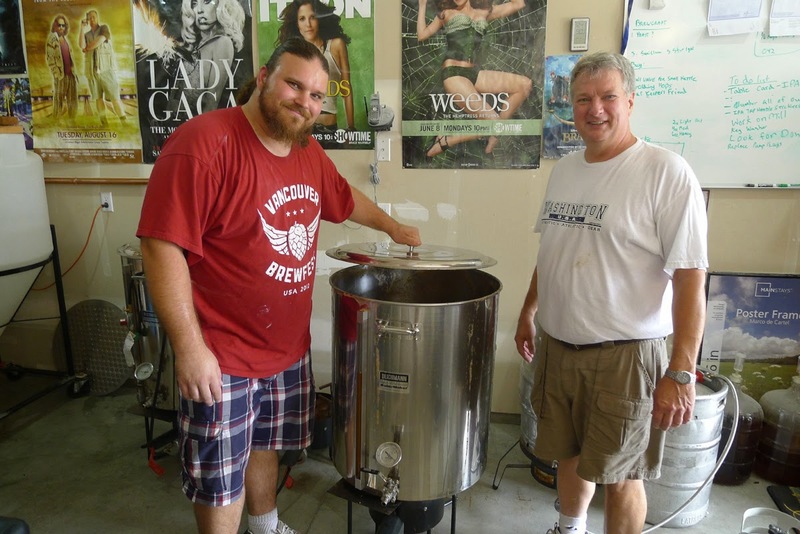 Don and Sam intend to expand their brewing capacity as demand for their beer grows. They have no thought of borrowing money to finance a larger operation. It's pay as you go. 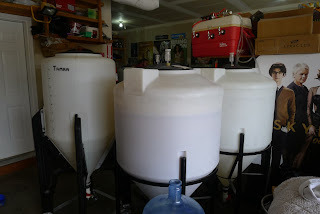 They use plastic fermenters because the cost is a fraction of what stainless steel fermenters cost. You worry about scratches with plastic, so they use a spray system that cleans and sanitizes without rubbing or scrubbing. West Highland is essentially a step up from homebrewing. 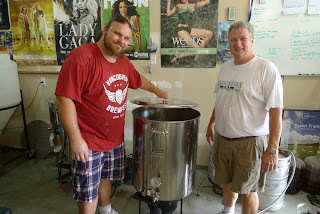 They have more capacity than most home brewers and they are developing a list of draft customers. A lot of people started out this way. If things go well, these guys will likely have a 5 bbl system in a year. There's even a chance they may bottle for retail sale in the next year or so. 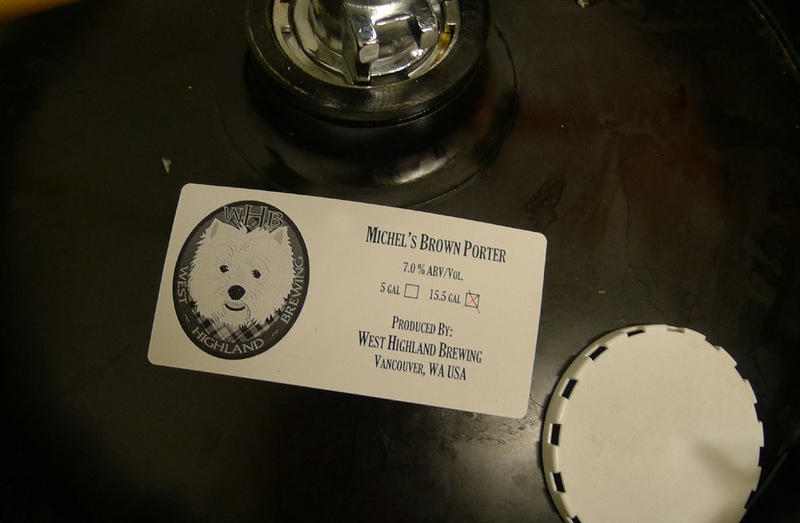 For now, their beers are Vancouver only and can be found in several places, including Blind Onion Pizza, Cascade Bar and Grill, Jake's Bar & Grill, Kiggins Theater, Pizza Schmizza and Vancouver Pizza. There will surely be additional locations pouring West Highland beer soon. Interest is high. With respect to the name, it's pretty easy to figure out if you look at their logo or visit the garage brewery. 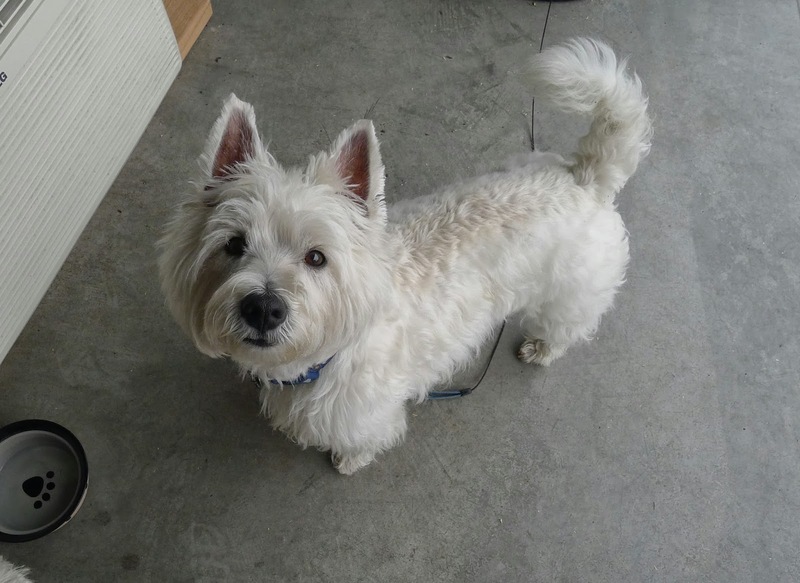 The face on the logo is a West Highland Terrier. There was a pair of Westies hanging out in the garage area while brewing operations were in progress...Gavin and Fiona. The dogs keep a watchful eye out for beer seeking interlopers.